Filling your aquarium after a water change usually entails you standing or sitting there with your eyes glaring at the fill hose, if you are not already holding it. The one time you look away, the fill hose will inevitably slip out of your tank, and start filling your floors with water. The Python Hook solves that issue by "hooking" your water change fill tube on the edge of your tank allowing you to keep up with other maintenance items while your tank is filling back up. 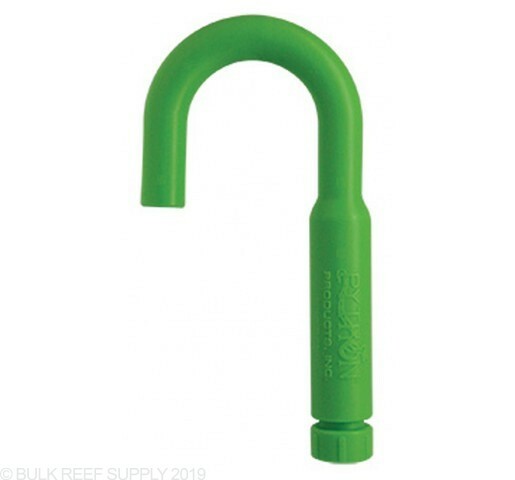 The HOOK from Python will make your general maintenance water changes much easier. By simply hooking the Python No Spill Clean and Fill to the Hook you can hang the Hook on to the edge of the aquarium without the fear of kinking, or slipping. With your hands free you can now maintain other parts of the tank while the water is being filled back into the tank. Constructed with the highest quality American made, BPA, Arsenic & Lead Free materials, you can safely refill your aquarium with peace of mind.